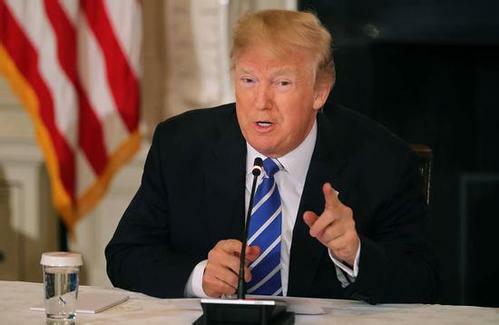 U.S. President Donald Trump said he is "not backing down" on his plan to raise taxes, known as tariffs, on imported steel and aluminum. However, members of his Republican Party and leaders around the world are warning the taxes are not a good idea. The president has said products from Canada and Mexico, two of the largest steel exporters to the U.S., would face the tax just like all other countries. But he suggested that he might be willing to exempt the two countries if they agreed to different terms for the North American Free Trade Agreement, or NAFTA. "No, we're not backing down," Trump said in the Oval Office during a meeting with Israeli Prime Minister Benjamin Netanyahu. "We've had a very bad deal with Mexico, we've had a very bad deal with Canada — it's called NAFTA," Trump said. Trump made his comments after a spokeswoman for House Speaker Paul Ryan said the Republican leader was "extremely worried" about a trade war. She added that Ryan urged the president "to not advance with this plan." The Trump administration says the tariffs are necessary to support American industries that are important to national security. But the president's comments and messages on Twitter have suggested that he is seeking to influence talks on NAFTA. The latest round of a nearly yearlong renegotiation effort is coming to an end this week in Mexico City. Trump tweeted, "Tariffs on Steel and Aluminum will only come off if new & fair NAFTA agreement is signed. Also, Canada must treat our farmers much better. Highly restrictive. Mexico must do much more on stopping drugs from pouring into the U.S."
Trump's announcement last week that he would place tariffs on steel and aluminum imports unsettled the stock markets and angered allies. The U.S. military has asked for targeted tariffs on metal imports from countries like China. It warned that tariffs on all countries would hurt national security partnerships with some countries. But other officials supported a tariff without exceptions. Speaking on a Fox news program, White House trade adviser Peter Navarro said: "25 percent on steel, and the 10 percent on aluminum, no country exclusions — firm line in the sand." Republican South Carolina senator Lindsey Graham said the sweeping action would let China "off the hook." He also said it would divide the U.S. and its allies. Jean-Claude Juncker is president of the European Commission. He said the European Union could answer by taxing American goods including whiskey, blue jeans, and Harley-Davidson motorcycles. Trump replied by threatened to tax European cars if the EU raises tariffs on American products. Commerce Secretary Wilbur Ross called threats from American allies "pretty trivial" and not much more than a "rounding error." Douglas Irwin is a Dartmouth College economist. He recently published the book "Clashing Over Commerce: A History of U.S. Trade Policy." He told the Associated Press, "Usually, all sides lose in a trade war. Trade shrinks as countries pile on barriers in an effort to remedy some grievance, with consumers paying the price." Trump administration officials said Monday that the tariffs will be made official in the next two weeks. In these circumstances, it is the managers who come off best. The most important thing is to reach an agreement and to avoid a trade war. They also hammered away at Labor's plans to raise taxes. 5.U.S. President Donald Trump said he is "not backing down" on his plan to raise taxes, known as tariffs, on imported steel and aluminum. It's time to duel, and there's no backing down. That strike ended with the minister backing down. 6.Trade shrinks as countries pile on barriers in an effort to remedy some grievance, with consumers paying the price."